Hello everyone! It's Tutorial Tuesday and I a masking technique to share with you. Now I know the masking technique has been around for awhile but sometimes it good to get back to the basics and revisit some favorite techniques. 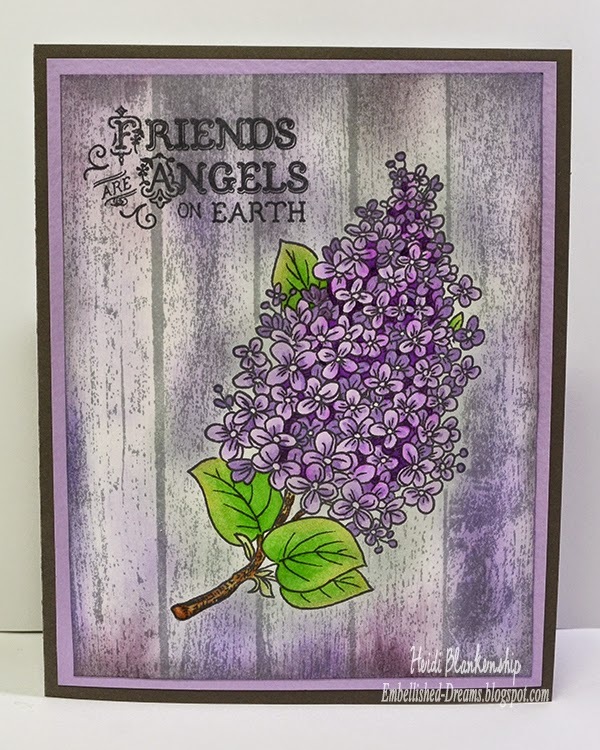 Here is the card I designed using the CR-02161 Lilac Blossoms Clear Stamps and CL-02153 Upcycled Woodgrain Cling Background Stamp. One of the things I love about the masking technique is being able to take a couple stamps or several stamps and layer them with masking to create the look of one image. You can really expand your stamps and create all kinds of images using this technique. To see more pictures and find out all of the details you can click HERE to visit the JustRite Inspiration Blog or you can click HERE to see my video. Awesome card!! Just watched the video..I really like that background stamp!! Gorgeous card, love the background stamp!